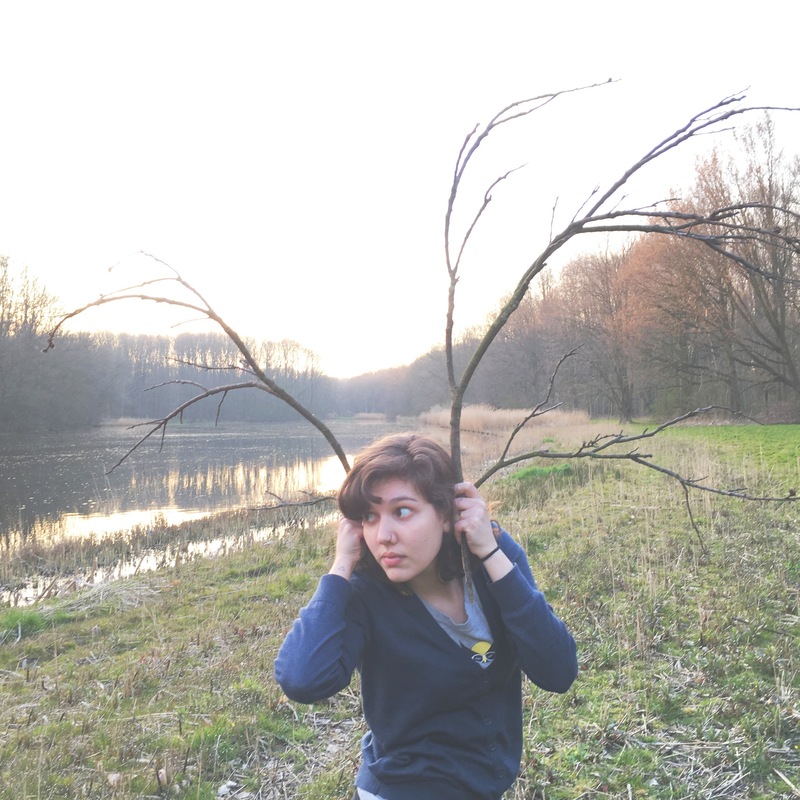 You are here: Home › My Zero Waste Life › Plastic-free July is here! 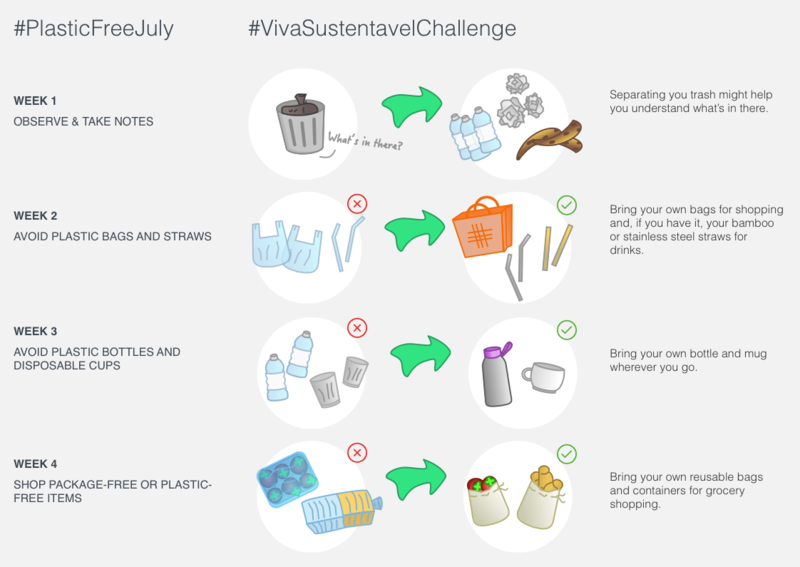 It’s plastic-free July and I couldn’t let it pass without inviting you all to take the challenge, of course! The campaign started in 2011 by the Earth Carers Waste Education team at the Western Metropolitan Regional Council in Western Australia. You can register for the official campaign at their website, which is great, and every week they will send you tips and tricks on how to live without plastic. Also, there is a bunch of great content in their website, so go check it out! I’d like to also propose a simple challenge for this month, from me, to you, so we can empower and support each other more as friends and companions during this month. So pull your sleeves and let’s get started! Every week we will have one main topic to challenge our consumption behavior, all of them are already listed below, so you can have an overall idea of what we will have achieved by the end of the month. I will post on Instagram and Facebook every Monday to remind you of the challenge, so be sure to follow me! The challenge starts next Monday (July 3), and ends in the last Monday of the month (July 31). So yes, I know July has already started and you might be like “OMG, I won’t be able to organize myself”, but fear no more, because I will give you a first week to actually look around and observe your behavior, which I believe is one of the most important steps for preparing ourselves to change. During this week, go on with your normal routine and try to be aware of the all the plastic items you consume. Go to your trash bins and note what’s in there. How much waste do you create in a week? What are the packaging items that seem really unnecessary? What are the ones that could be avoided, reused or recycled? Take notes, and if you feel inspired by your findings, share the notes with me, with friends, your roommates or your household. How did you feel after this week of observations? Ready to make some changes? Let’s move the the second week, then! Week 2: Say NO to all plastic bags and straws. Going out for drinks? What about exercising your skills of saying “… and no straws, please”? It might take a while for you to feel comfortable saying it out loud and facing people’s confused looks, but after a week I’m sure you will be feeling super confident and avoiding this short time pleasure that goes down the ocean and kills poor turtles that didn’t even enjoyed the coke. Week 3: Say NO to plastic water bottles and disposable cups. If there’s one thing that you can be sure of is that you are gonna feel thirsty at some point during your day, and sometimes in unexpected places or situations. What about training yourself this week to always have your own refillable water bottle with you? So instead of rushing to the shop and buying another disposable water bottle, you can just run to the closest water fountain and refill your own bottle (or ask at the counter of any shop for them to help you out). And the best part: IT’S FREE. (And of course, it avoids whales from mistaking the plastic bottle you disposed by food and dying, and it for sure will not contribute to the build up of plastic islands in the pacific). Pro tip: If you are in an area that tap water is not safe for drinking, DON’T drink it. Instead, look for filtered or boiled water. Most places, though, specially in Europe, North America Oceania and, yes, Brasil, you can safely refill straight from the tap. The chances of you having a bug infection by drinking tap water are lower than eating contaminated beef that traveled from elsewhere in the world to make up your burger. In a waiting room and feeling thirsty? Well, luckily you have your water bottle with you, right? What about that coffee, you are really a coffee addict and can’t wait for getting some coffee? I have to sadly point you to those plastic or foam cups laying there waiting for you to throw them in the trash after you drink your ~not so tasty~ coffee. Come on, waiting room coffee is always a bit weird, so why don’t you wait and go to a real coffee place afterwards? Pro tip: You can carry a mug with you and fill it in with that coffee. I usually have mine with me, and it actually makes coffee tastes better, since plastic has its unique way of tasting so bad (and it’s pure cancer!). Remember all the unnecessary packaging you found in your garbage bins the first week? What are the things you might be able to find replacements? I bet you can find some even more delicious olives by bulk and by weight in a nearby grocery shop. Instead of going right away to get the processed bread wrapped in plastic in the shelves, what about bringing your own cloth bag and getting some fresh baked bread in it from the counter? Are there apples without the wrapping? Get those and put them in your own cloth bags as well. Also, if there’s no option of the veggie you are looking for without plastic, that might be because it’s out of season and we are wasting resources to bring it to the shelves in your part of the world, so maybe avoid it and help decrease demand? If there’s something you still want and there’s no way you are gonna find it without packaging, look for other options besides plastic. Rice in a box. Juice in glass. Peas in a can. If still the items only come in plastic, look for the biggest one! Also, don’t forget to reuse or recycle these the proper way afterwards. Try adding up the new challenge on top of the previous one. When you ask for something without plastic (like “no straw, please”), and you still get the damn plastic, politely advice them to start asking before serving everything with it, don’t they always ask if you want lime and ice anyways? Convince a fellow to join on with you, it’s more fun with friends! And it’s over! How do you feel? Once July is over, evaluate how you did. In which weeks did you feel more challenged? Why was it? What were the most difficult parts? Where can you improve? I would really love to hear from you! And of course, this challenge is suppose to be fun, make you feel more aware and show you that once we get started, simple changes can actually have an impact, make your life easier and all of our lives better! I strongly recommend you don’t lose focus and you keep on avoiding as much plastic as possible.